Just as done with W.E. Patt. '08, accoutrements for a Pistol Order were added to I.E. Patt. '14 shortly after its introduction. The new equipment was introduced with List of Changes entry L. of C. No. 17177, acceptance dates of 21st Jan 1915 and 8th Mar 1915, for "Pipers and Range-Takers". The open topped Pistol case and the Pistol ammunition pouch closely resemble their Patt. '08 equivalents, except that the 3-inch double brass hooks used with the earlier pattern are replaced by narrow buckled straps, and no separate Brace attachments are required; the "V" attachment and buckle make these unnecessary. The Case, pistol, Webley, with "V" attachment and buckle is used in the Patt. '14 Pistol Order. It is a sturdy leather envelope made for the Webley Mk. VI Pistol, with an open top and a single securing strap. It attaches to the Belt with two narrow leather buckled straps, and to the Braces via the "V" attachment and buckle, obviating the need for Brace Attachments, as are required with Patt. ’08 W.E.. The Case is maker marked "Beckworths Ltd C & M" dated 1916, the “C&M” denoting a Currier & Manufacturer. From the Lars Alfers Collection, photographs © Lars Alfers 2009. An interesting ownership mark of "H MGC" on a Case, pistol, Webley, indicating it was used in a Heavy Section, Machine Gun Corps (i.e., the fledgling Tank Corps). From the Paul Hannon Collection, photo © Paul Hannon 2011. The Patt. 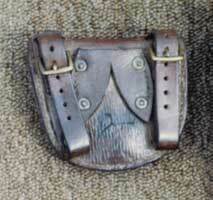 '14 Loop, dirk, was introduced along with the Pistol case and Pistol ammunition pouch, by L. of C. 17177. It replaced the Loop, dirk, brown (Mark I), which was declared obsolescent by L. of C. 17178, dated 19 April 1915. The Dirk loop was issued to Highland Regiments. KW have not located a photo of the Loop, dirk - neither of a surviving example nor an original picture. As a consolation, though, until we find a photo of the Dirk loop, we present this stirring drawing of Daniel Laidlaw V.C., the Piper of Loos, provided by Scots author John Bodsworth. His W.E. Patt. '08 Dirk loop is plainly visible in the illustration. Readers - over to you? The Pouch, ammunition, pistol, Webley, with "V" attachment and buckle is used in the Patt. '14 Pistol Order. 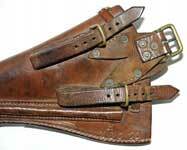 It is a simple leather Pouch designed to hold ammunition for the Webley revolver. It attaches to the Belt with two narrow leather buckled straps, and to the Braces via the "V" attachment and buckle. This example is maker marked "Wm. Overton & Sons, Walsall" and dated 1916. From the Chris Pollendine Collection, photos © Chris Pollendine 2012. 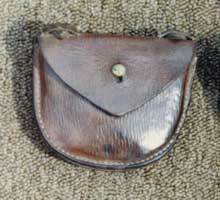 In this example of the Pouch, ammunition, pistol, Webley, with "V" attachment and buckle, the buckle portion has been cut-off above the buckle. Both Pistol cases and Ammunition pouches are commonly seen with this alteration. Photographs © J. Bodsworth 1987. A Machine Gun Section (or a Section) of 11th Machine Gun Company, Belgium, January 1917. The officers are wearing Sam Browne Equipment, OR's in I.E. Patt. '14. Note the nine men wearing Patt. '14 Pistol cases, at either end of the front row. Interestingly, there seems to be only one man, 5th from left, wearing Patt. '14 Pistol Order including the Pouch, ammunition. Presumably, he is the Range-Taker, and the other eight are Gun Numbers 1 and 2. Photo provided by Paul Hannon.